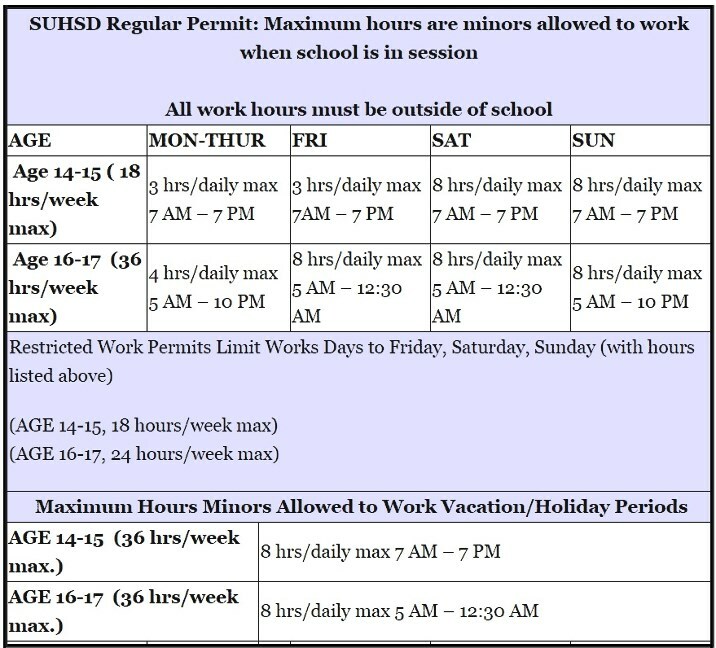 Students who attend Sweetwater Union High School District are required to obtain a work permit if they are under 18 years old, and have secured paid employment. The work permit is required by CA Education Code and is enforced by the CA State Labor Department. Sweetwater Union High School District students must meet and maintain 2.0 G.P.A. (grade point average) and attend school regularly and on time to obtain and keep a work permit. The application has a water mark that says "THIS IS NOT A WORK PERMIT". This is not a problem, since this is an application to get the actual work permit. Make sure it has BOTH employer AND parent signatures and information, and your social security number. Next, bring the application to our CCA counselor to fill out the school office section. Take the completed application along with the items listed below to the Public High School you are zoned for. Ask for the BVHS admin person responsible for handling Work Permits (Jackie Hernandez). A letter from the school on school letterhead stating that the student is currently enrolled at CCA. If applying in the summer, the letter from the school should state that the student will be attending in the Fall of the upcoming school year. Once the application is complete, take it to your employer. The employer is responible to keep the work permit at the work site.